I have a large (~70MB) shapefile of roads and want to convert this to a raster with road density in each cell. Ideally I'd like to do this in R along with GDAL command line tools if necessary. But, in neither case, does the kernel approach come close to aligning with the more direct approach above. How can I interpret the output of the density.psp function? What are the units? How can I choose the sigma parameter in density.psp so the results align with the more direct, intuitive approach above? Bonus: what is the kernel line density actually doing? I have some sense for how these approaches work for points, but don't see how that extends to lines. I posted this question on the R-sig-Geo listserv and received a helpful answer from Adrian Baddeley, one of the spatstats authors. I will post my interpretation of his response here for posterity. Adrian notes that the function spatstat::pixellate.psp() is a better match to my task. This function converts a line segment pattern (or SpatialLines object with conversion) to a pixel image (or RasterLayer with conversion), where the value in each cell is the length of the line segments passing through that cell. Exactly what I'm looking for! The resolution of the resulting image can be defined with the eps parameter or the dimyx parameter, which sets the dimensions (number of rows and columns). The results are exactly as desired. computes the convolution of the Gaussian kernel with the lines. Intuitively, this means that density.psp 'smears' the lines into two-dimensional space. So density(L) is like a blurred version of pixellate(L). In fact density(L) is very similar to blur(pixellate(L)) where blur is another spatstat function that blurs an image. [The parameter] sigma is the bandwidth of the Gaussian kernel. The value of density.psp(L) at a given pixel u, is something like the total amount of line length in a circle of radius sigma around the pixel u, except that it's really a weighted average of such contributions from different circle radii. Units are length^(-1), i.e. line length per unit area. It remains somewhat unclear to me when the Gaussian kernel approach of density.psp() would be preferred over the more intuitive approach of directly calculating line lengths in pixellate(). I guess I'll have to leave that for the experts. Not the answer you're looking for? Browse other questions tagged raster r road kernel-density spatstat or ask your own question. Converting line vector layer to raster with pixellate.psp creating missing data? 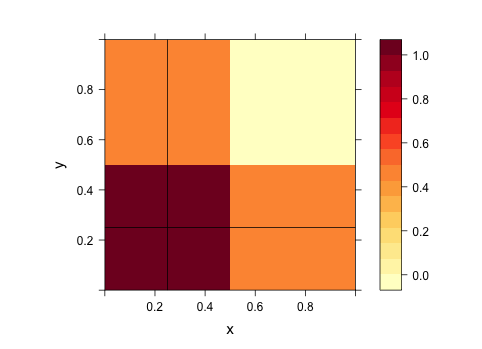 How to do a Kernel Density map from weighted point observations using a Cauchy kernel? Counting raster values using another raster as mask in R?